This was a milestone toward the Red Carpet event of the 10th Anniversary Gala. We had cooperation from the weather and fantastic participation in the painting of the floor mural. 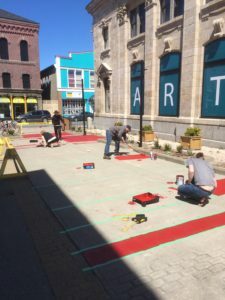 Special thanks to the measuring tape, masking tape, and painting team: Suzanne Babin-Muise, Shari Surette, Brian Porter, the three guys who just showed up – Mark Davis, J0b Fiander and Joe Falls, and Councillor Sandy Dennis. Thanks also to Carole Bojarski and Angela Collier for moral support, coffee and lunch. 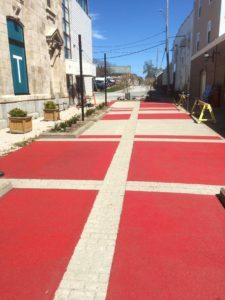 The Alma Square Floor Mural was conceived as an extension of the Paths We Share exhibit opening at the Art Gallery of Nova Scotia on May 28th, 2016. One of the paths we all share in life is patterns of biology which often, surprisingly, are also mathematically describable. One of these sequences of life forms was discovered by the mathematician, Leonardo of Piza, also known as Fibonacci. This simple sequence of 1.1.2.3.5.8… where the last two numbers are added to get the next is amazing descriptive of life form sequences such as the spirals of sunflower seeds and shells. Artistically these sequences produce a unit called the “golden mean” which often shows up in painting composition and in the proportions of great architecture. Our concept for Alma Square is that we will lay down one of the most basic paths we share patterns and that, over time, others will add to and elaborate on this pattern of life in an evolutionary manner. You will note that there is a counter pattern that has not been painted. While life has structure it also has variation. This is not a static design but an opportunity for the community to express itself and its vision of the future of life images. If that is a bit heavy, just enjoy the patterns.